Horatio Hight served Co. C of the 12th Maine Regiment during the Civil War. He enlisted as a second lieutenant on November 15, 1861 at the of age 27, and was promoted to first lieutenant on December 4, 1862. On January 10, 1863, he resigned. He received a bounty of $200 on April 27, 1864 for reenlisting. 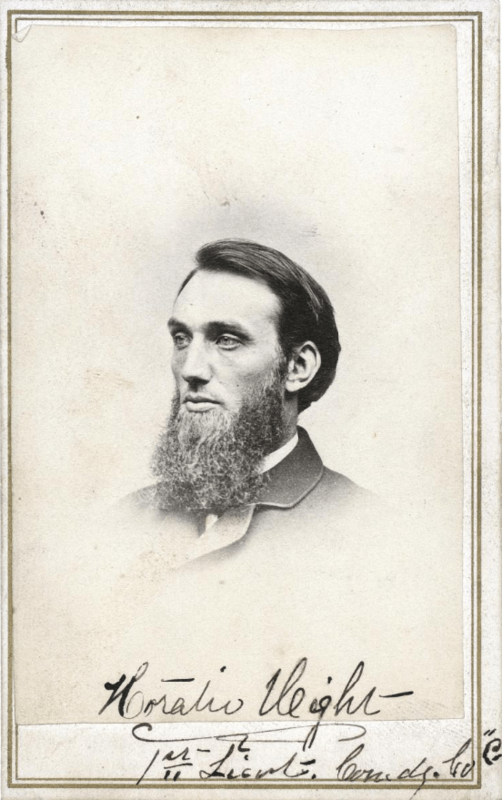 Hight was one of four children of Amos and Eliza Hight. In 1856, he was a student at the Maine Wesleyan Seminary, now known as Kents Hill School. In the 1860 US Census, the Hight family was listed as lived with the Freedom Milliken family. Freedom Milliken also served in the Scarborough regiments during the Civil War. At the time of his enlistment, Hight was single and a resident of Scarborough. After the war, he married Clara E. Milliken and a son, Clarence, was born in 1868. The 1870 US Census lists Horatio as a teacher. After the war, Hight was appointed by President Andrew Johnson Assistant Appraiser of Merchandise for the city of Portland. He served as a customs officer from 1866 to 1888. Horatio Hight died on July 9, 1899 in Portland and is buried in Portland’s Evergreen Cemetery. This entry was posted in They Answered the Call and tagged Amos Hight., Civil War, Clara E. Milliken, Eliza Hight., Horatio High. Bookmark the permalink. Enter your email address to subscribe to the Scarborough Historical Society pages and receive notifications of new posts by email.